A challenge in the Art of Ancient Egypt: Osirian-Solar Iconography. One of the main challenges for priests and artists in Ancient Egypt were to combine the osirian and solar cosmogonies in the funerary literature and iconography. The two main pillars in the belief of resurrection in Ancient Egypt were the myth of Osiris and the solar theory. The central aspect in the first one was the resurrection and new life in its most human version: a human body (Osiris), which needs to be embalmed and revived for the eternity. In the second one the stellar body (the sun-Re) did a cyclic trip through the sky; it died in the night and sailed in the solar bark through the dark sky; in the morning after the sun came back to life renewed plying the clear sky. In Ancient Egypt both ideologies, due to its importance, were quickly conciliated as two versions of a same concept. In the thinking, ancient Egyptian priests could unite Re and Osiris in the funerary texts through the narrative, that is why, for instance, in chapter 67 from the Book of the Dead the dead Osiris wants to get out from the tomb and get into the solar bark of Re. Isis and Nephtys with Re-Osiris. Tomb of Nefertari. XIX Dynasty. What happened in the art of Ancient Egypt? New decorative motives were introduced in the canonical iconography for depicting the union of Osiris and Re. One of the most popular is the scene belonging to chapter 180 of the Book of the Dead in the tomb of Nefertari. The ancient Egyptian artist here depicted the union of both gods in a ram-headed mummy with the solar disk, the inscription next to the figure reads: “This is Re satisfied with Osiris, Osiris satisfied with Re”. But it is not the only Osirian aspect in the scene. 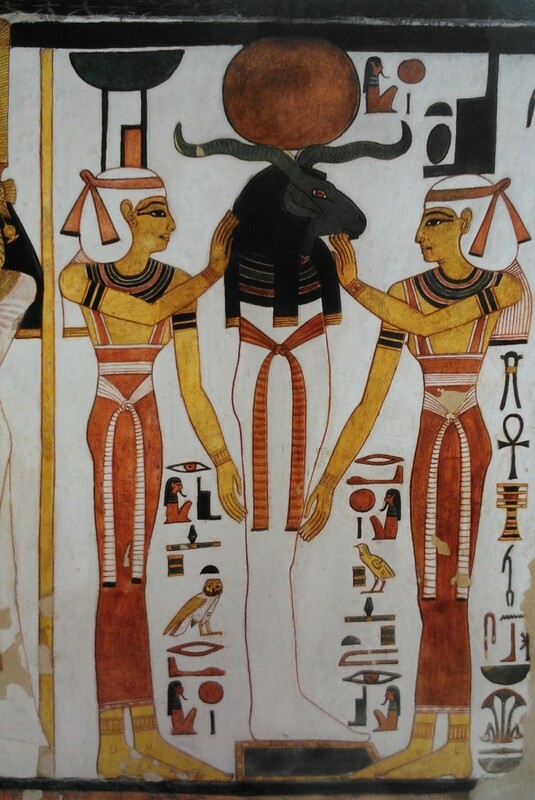 The two mourners of Osiris, Isis and Nephthys are also there at both sides of the ram-headed mummy. These two women were essential in the thought of Ancient Egypt for the final resurrection of the dead. Thanks to her magic the corpse could recover some vital faculties for the new life, and they had to be included also in a solar perspective. So, four elements seemed to be necessary in this osirian-solar iconography of Ancient Egypt: Re, Osiris, Isis and Nephthys. As we will see in following posts, the art of Ancient Egypt could not omit the two professional mourners from it. Ancient Egyptian Union and Rebirth of Re and Osiris.